This is a new piece I finished recently. 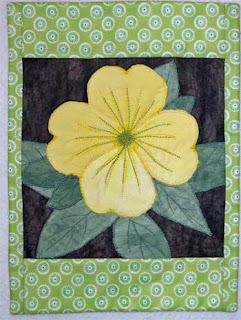 The Four O'clock flower is inspired from a picture that I took of the Four O'clocks that grow in my flower bed. My mother-in-law gave me the seeds when I lived in Columbus. On my last visit there, they were blooming. I dug up some of these hardy little plants and yes, they really love Virginia weather. 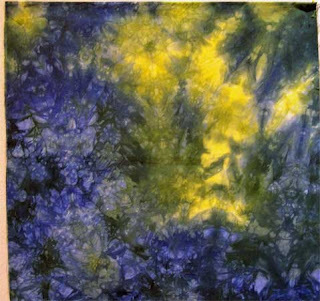 The yellow fabric is fabric I dyed last week. I used a "new to me" type of applique to make this. 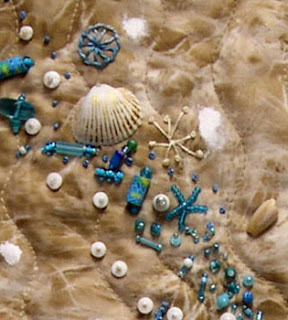 I am currently taking an online class with Susan Brittingham and she teaches an applique method called "UDA" or Upside Down Applique. I wasn't crazy about the satin stitching on the edges so I probably won't use this method that much. I machine quilted it and used free motion embroidery on the flower center. 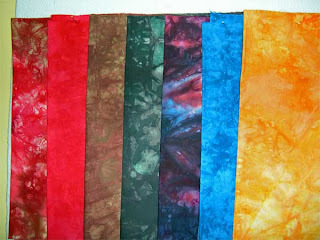 Here are pictures of my first hand dyed fabrics. It was so much fun to do and it is a surprise as to what they will look like. I scrunched the fabrics into 1 qt. plastic containers and used two different colors in some of them. 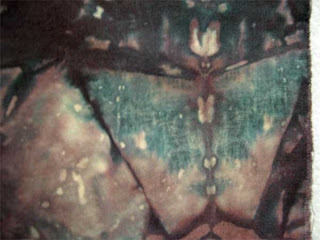 This all results in a batik-like, variegated look. I didn't make a mess at all! Taylor (our cat) is still the same color, not purple at all. I dyed half-yard pieces and now I have to go out today and buy more fabric! Most of these are the PFD fabric by Kauffman. I want to try muslin next time. This is a closeup of one of the fabrics. It came out looking like a moth or butterfly! I only used the three Primary colors to get all of this. It was fun trying to remember the color wheel and what to mix to get what. I'm going to dye fabric today. This will be my first time to do this with the Procion MX Dyes. I have my dye clothes on, gloves ready, supplies purchased and will try to not make a mess! I will post pictures of it when I'm done. My dye class was cancelled so I decided to do it on my own. 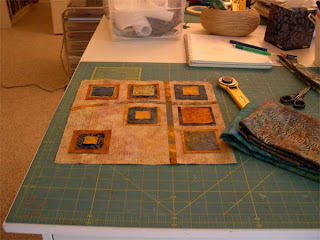 Here are two photos of my latest work that I am calling "Squared Away 1" I think it will be a series of squares. This is the first piece I have made since my studio makeover so it is appropriately named in celebration of my quilt supplies being squared away. My things are not "perfectly" stored away, thus the abstract. I still have some fine tuning to do on the studio. The photo below is a detail shot. I also got my Bernina back into my machine cabinet and used it to quilt. I did have to tweak the tension a bit, but it was a trooper and quilted just fine. I used Sulky Blendables size#12 on top and So Fine by Superior Threads in the bobbin. I decided to quilt curves to break up the sharpness of the straight lines in the quilt. 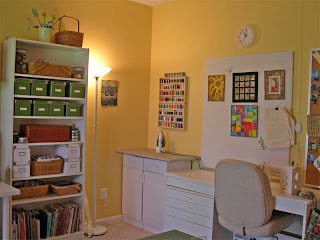 Before I forget, thanks to all of you who commented on my studio makeover. I really do love the new color. Here are pictures of two of my current WIPs. The first one is a series of squares. I say series because I seem to be creating squares in that direction. Hopefully I can finish this one today. 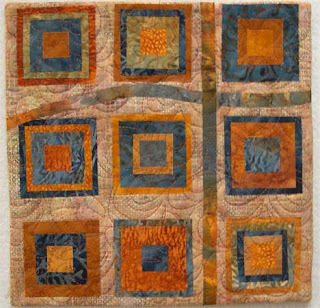 It is a 12" square for the SAQA monthly group. 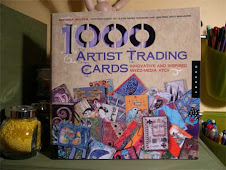 The next one is a drawing and value map. 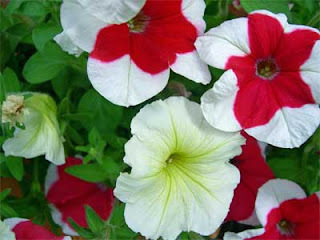 The picture is one I shot of my petunias growing outside my studio. 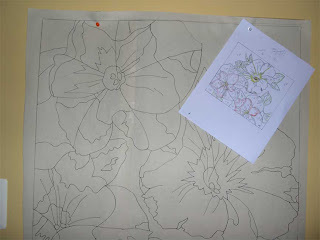 I then created a drawing of it and enlarged it using my over head projector. You can see the cord on the floor in the first picture. I love this process and will post progress on this as I go. 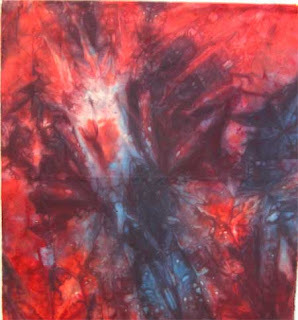 I am trying to stick to complementary colors in the squares series. 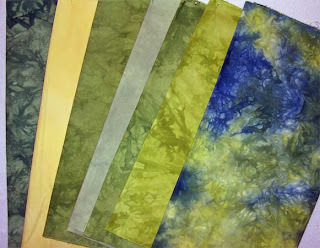 I signed up for a fabric dyeing class, bought the supplies and then it was cancelled. I have decided to try to learn it on my own. Anyone have any good book suggestions on the subject? Here are pictures of our new baby. 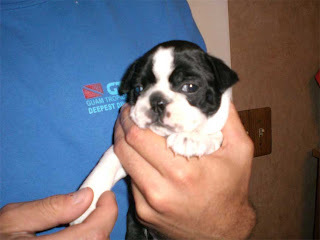 She is a Boston Terrier puppy and so adorable! She is almost a month old in these pictures. We get to pick her up Sept.1st and we can't wait. As most of our friends know, we are already familiar with Bostons because our daughter and son-in-law have a sweetie named Betty Boop. The first two pictures are of Matt, our son, holding her. Stephanie and Matt found her and even picked her out for us. They did a perfect job, isn't she adorable? Now, we have to have a name for her. Any suggestions? We are leaning toward Emma. I'm so excited!!! 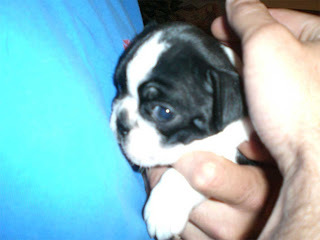 We finally will have a sweet little Boston of our own. 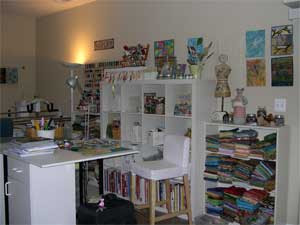 Here are the new pics of my studio makeover. The "before" pictures are just too messy for me to post. LOL! I realize these are not the best quality pics but they will do for now. 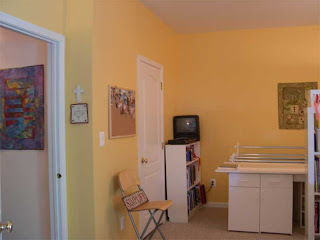 I love the new color on the walls...it is Benjamin Moore #179, Honey Wheat. I moved the cubes to divide the room and now the HQ16 is behind the cubes in an area of it's own. 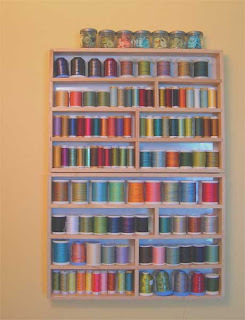 The thread racks on the wall are silverware boxes that I purchased from Target. The green boxes are from IKEA, my favorite store for finding such things. I am currently reading "The Artist's Muse, Unlock The Door To Your Creativity" by Betsy Dillard Stroud. I find it very intriguing and informative. There are challenges at the end of each chapter to help jump start your creativity. After a week of visiting relatives and not being able to work on my art, I find the challenges are just what I need to get back into the groove of creativity. I highly recommend the book. 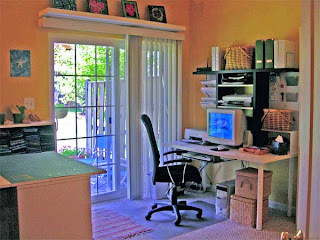 I am off to download the pictures of my new studio makeover. I have been gone way too long from the blog! I was in the midst of a "studio makeover". Lots of organizing, tossing and we even painted the walls. I will add pictures of the new look later this week. 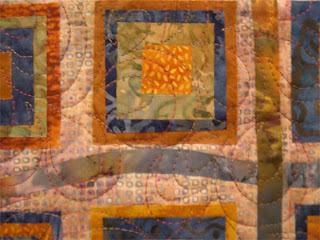 This is my quilt that was in the Sacred Threads show in Ohio last month. 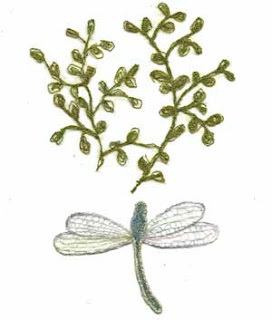 It is beaded, painted, free-form embroidery and machine quilted. 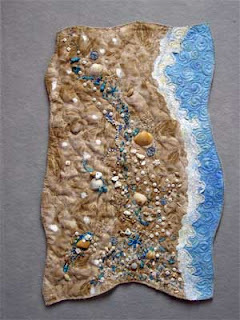 I really enjoyed making this one because I was able to incorporate shells I found while walking on the beach. 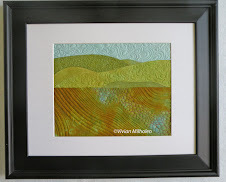 This was a fun class project of a machine embroidery class I am taking at Quilt University. It is all thread on a solvy and/or tulle base. Fun! All free-motion embroidery. Tomorrow is July 4th already! Tonight, we are going to walk to the golf course (across the street) to a fireworks celebration. Our housing area has lots of celebrations. They have a band with dancing on the town square every Friday night during the summer. 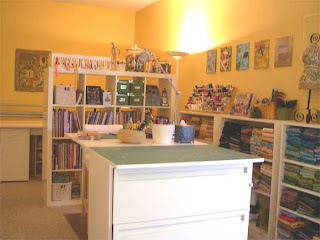 I have worked hard on getting this studio in shape and now I hope to spend some time working on new quilt projects. I have plans for the new fabric I just painted with Setacolor.